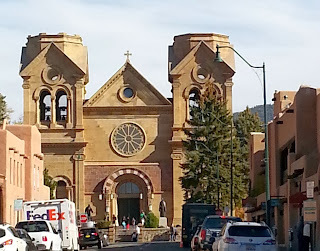 Heading for Taos, the last of our planned stops before embarking on a faster pace to Kentucky, we made a short stop in the lovely art town of Santa Fe. 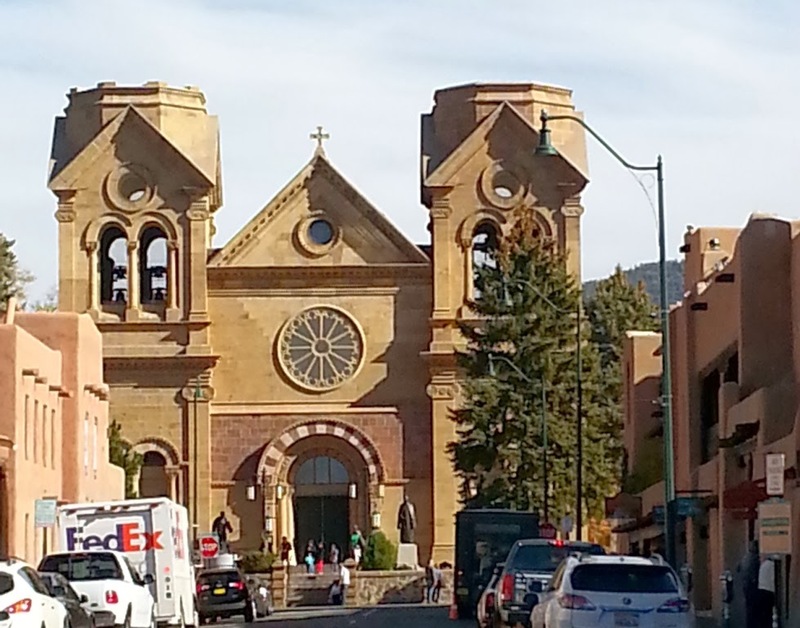 No one told us about the narrow streets in Santa Fe’s Old Town and heads were shaking as we dodged historic overhanging eaves, looking for space in coveted parking lots. We finally tucked Lilypad into a side street and were grateful to be close enough to walk around this beautiful town. At the museum we enjoyed seeing O’Keefe’s early work and a great exhibit of her big paintings featuring trees. 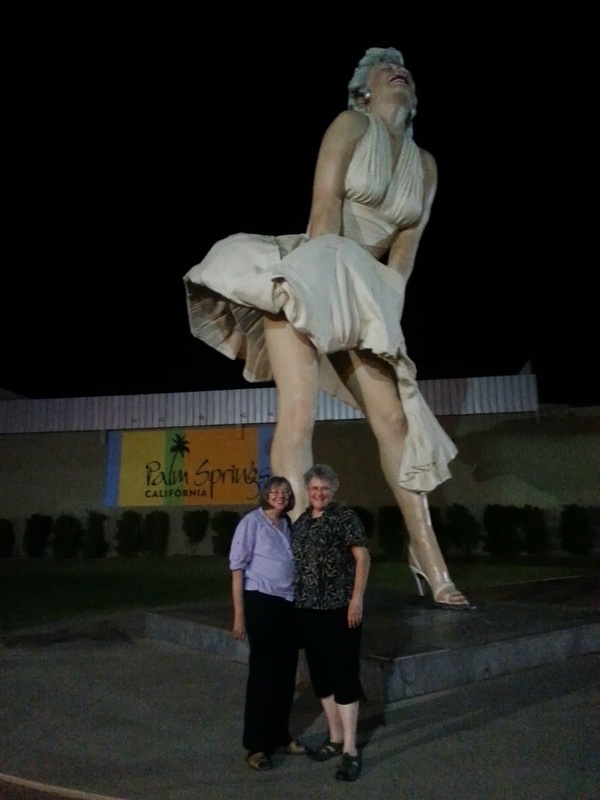 Most of her New Mexico work was not here, but fortunately some had been loaned to the Heard Museum in Phoenix, and we had seen it there! We then spent a couple of hours window shopping and visiting stores. 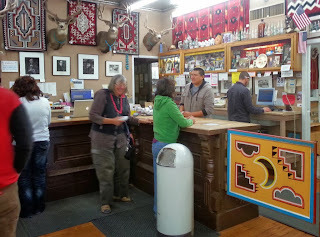 It was fun to see the names and pots of some of the women we had met on our Acoma tour. We also encountered a great-grandson of Maria Martinez who was selling pots in a line of vendors in front of the Governor’s Mansion. He proudly showed us pictures of his famous cultural lineage and we told him we treasured a pot made by his famous matriarch, which we inherited from Liz’s parents. 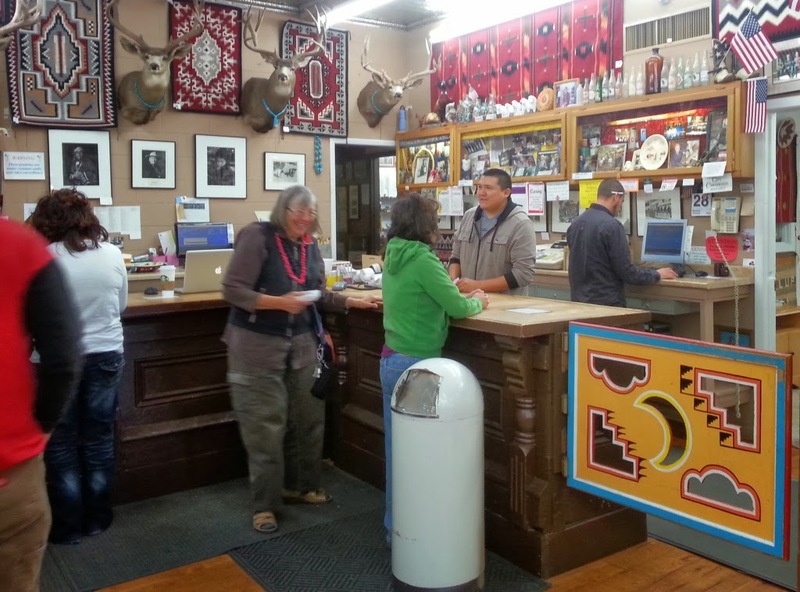 The takeaway from our fleeting visit to Santa Fe was that we want more. 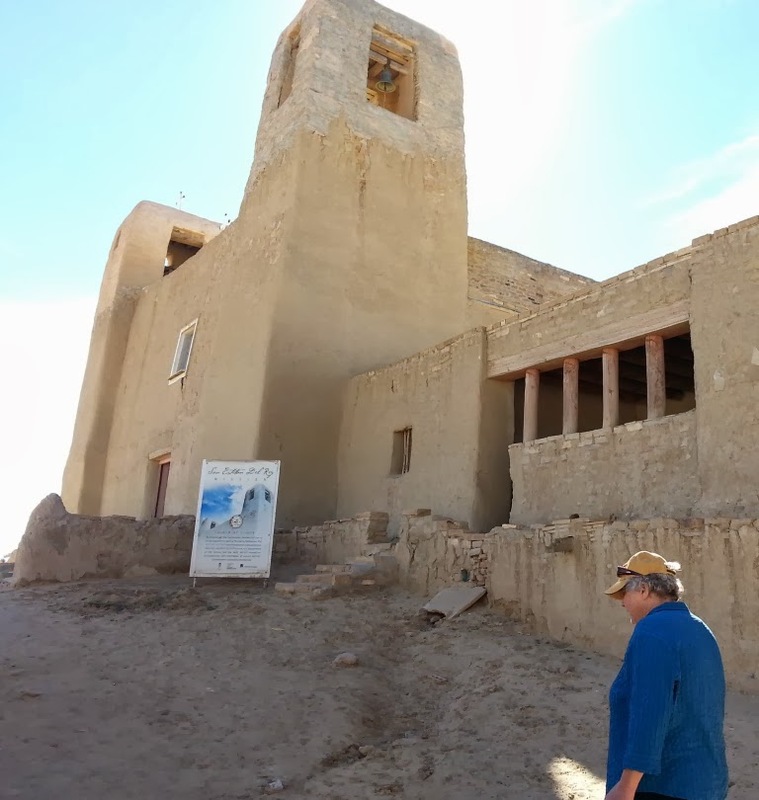 We’d like to find some immersion experience in Santa Fe to gain a deeper understanding of the history of culture in that fascinating place. We then cautiously threaded our way out of Santa Fe and took Highway 64 up to Taos. This narrow twisty road bordered the Rio Grande River and brought us through the heart of the recently minted Rio Grand del Norte National Monument. Established at the same time as the San Juan Islands National Monument, this beautiful piece of public land includes a high mesa scoured by the gorge of the Rio Grande. Climbing up to the ridge of the mesa and looking out over the river gorge was breathtaking. 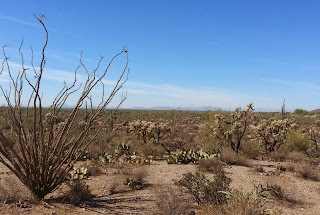 We then drove north into the Apache Reservation. This took us through the Salt River Canyon, an area similar to the Grand Canyon in the richness of hues. The road snaked around in true scenic byway fashion, but this time with sturdy guard rails and lots of pullouts. Our route led us through Snowflake, AZ and we stopped at a petrified wood museum with an astounding number of rocks of every kind imaginable. This was in Holbrooke, a gateway town to the Petrified Forest National Park and sited on historic Route 66. 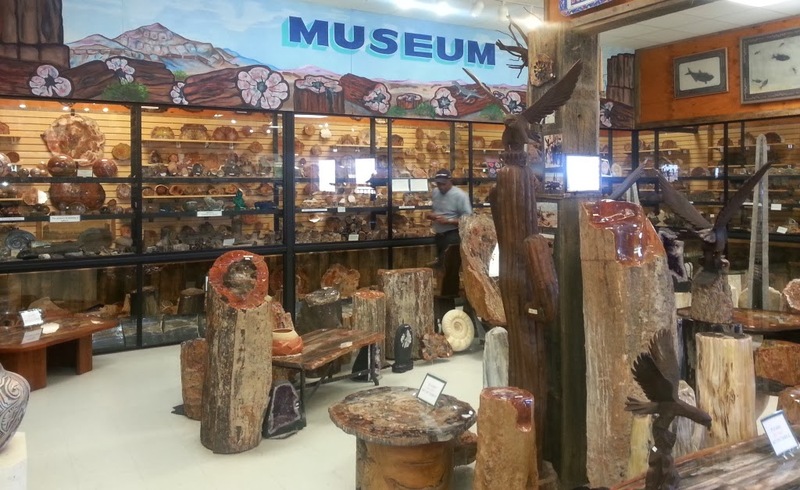 Here, too we were gifted with rocks: this time, small pieces of petrified wood. 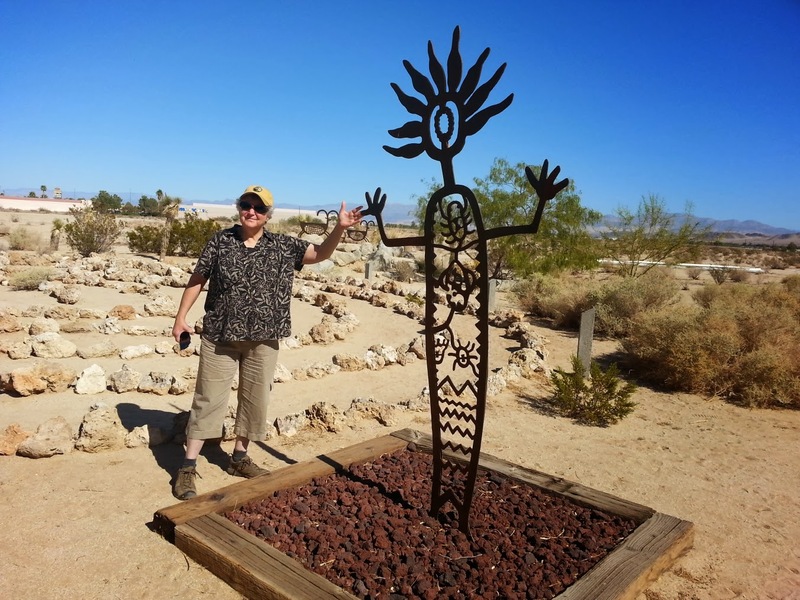 Thanks to the women of the US Senate (so says Time Magazine) the park was open and we stopped at the Rainbow Forest Visitor Center, watched the video, stared deep into agatized logs, and bought the park tour CD for the trip through the park. 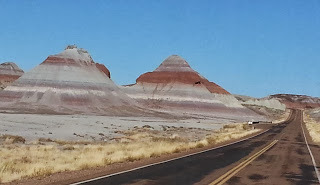 We took our time exploring the Park and the adjacent Painted Desert National Park, exclaiming anew at each designated viewpoint. Unfortunately our cameras simply could not do justice to the incredible colors. From both the visitor center video and the cd, we learned more about the Late Triassic Chinle Formation than anyone would ever want to know. John Lennon once said, "Life is what happens while you are busy making other plans." That is our story this week. Our travel plans have taken a major shift in response to the tragic death of our grandson Terry. We will be making tracks to Georgetown, Kentucky to join his mother Colleen and his three siblings: Charlie, Spring and Luke. There will be a memorial for Terry on November 16th. 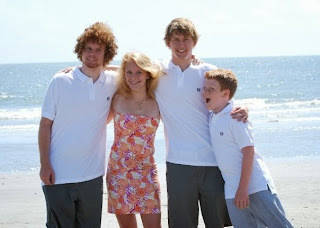 Here’s a picture of the four of them in better times. From left to right are Terry, Spring, Charlie and Luke. We’ve been pondering the concept of resiliency in terms of people and communities. One of our accidental stops was the high desert town of Yarnell. 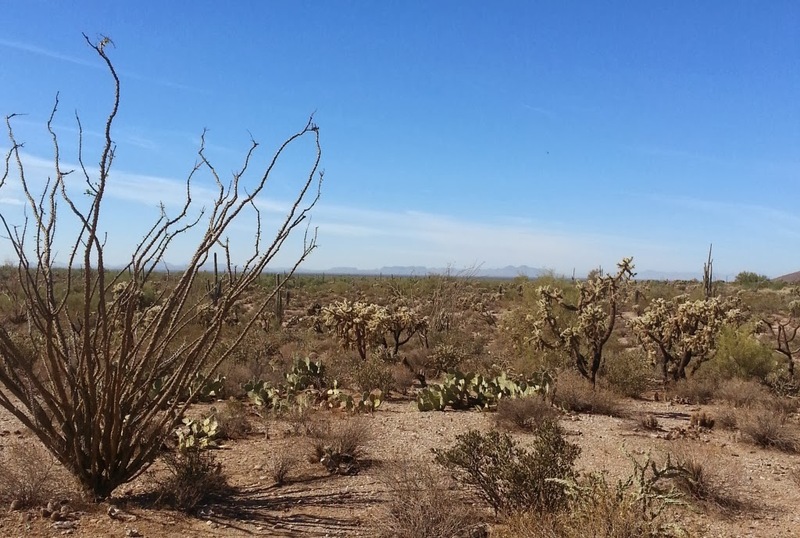 This was the place where a wildfire swept through a mountain village in Arizona on June 30, killing 19 firefighters and destroying 120 homes. We saw the burn and pulled over in front of the bakery in the main part of town. Everyone had a story to tell and what we thought might be a 10-minute coffee/bakery stop, turned into a two-hour conversation. Two shop owners told us that their homes were destroyed while their businesses were untouched. One said she thought it was only because all of the businesses had been spared, that that the town was going to survive. Had the businesses been destroyed, she said, Yarnell couldn’t have made it back. So what is the learning? Terry apparently made a choice that went badly and ended his life. This is something we cannot change. But we can try to remember to look for hope: perhaps it’s over there, on the other side of hopelessness. We can find opportunities to reach out to one another with love and kindness and not let our grief diminish us. 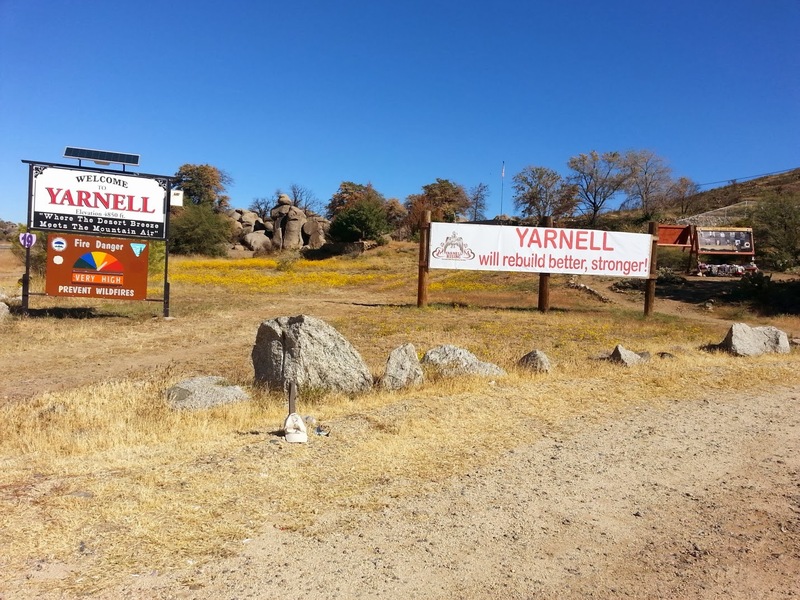 We can try to remember to find inspiration from folks like those in Yarnell. 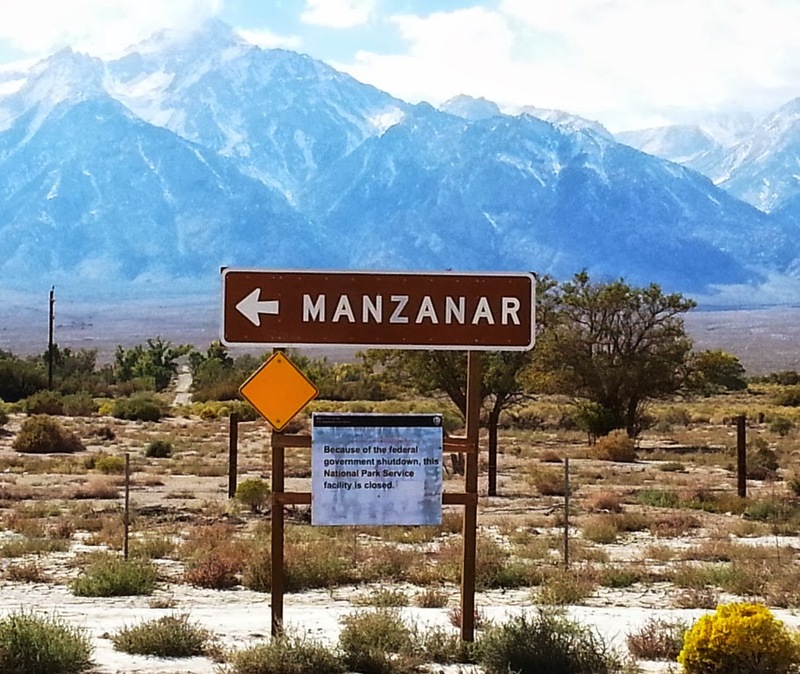 The Eastern Sierra Nevada Scenic Byway is an incredible mix of recreation, history, extreme natural phenomena, and glorious scenery. We came across the mountains via Highway 50, through the gold center of Placerville, down to South Lake Tahoe. This bustling tourist town was recovering from its busy summer and preparing for snow and the ski season. We went up and over another range of the Sierra (7,000+ feet!) and settled onto Highway 395 that took us south all the way to San Bernardino. On the way we visited three museums, a hot spring RV park (Keough’s), a film festival celebration at Lone Pine (where MANY old cowboy movies were made), and boondocked on a surreal lava moonscape called Fossil Falls which is managed by the BLM. The latter was not only interesting geologically, but one couldn’t help but crunch on millions of glistening obsidian chips while walking. These chips were knapped by Paiute people over thousands of years. 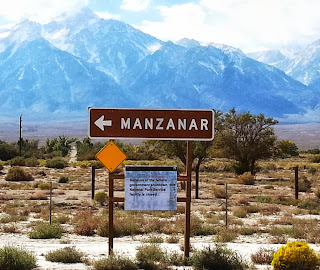 On the way we tried to visit the historic site of Manzanar, a despicable place of internment for so many Japanese-Americans during WWII, but because of the government shutdown, it was inaccessible. The internment was one of the darkest moments of American history. For those of us wanting to learn more about this important lesson, yet another bad decision prevents us from doing so. What are we doing?